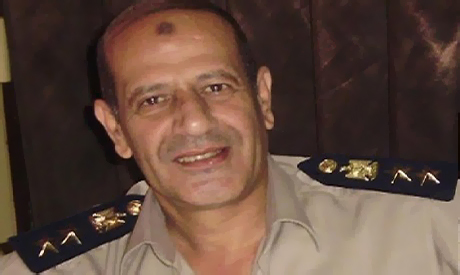 The Upper Egypt court sentenced on Monday 529 supporters of the Muslim Brotherhood to death on charges of murdering Mostafa El-Attar, the deputy commander of the Matay district police station in Minya, during riots in the aftermath of the dispersal of the Rabaa sit-in in August. The court also acquitted 16 other defendants. Only 147 defendants were present at the hearing, while the rest are on the run and being tried in absentia, according to Aswat Masriya. According to state news agency MENA, Morsi supporters are accused of killing the police officer and attempting the murder of two others, as well as attacking public property, torching the Matay police station, seizing police weapons and disrupting public order. The trial began on Saturday with the defence lawyers demanding the recusal of the judges' panel and its replacement with another, "unbiased", panel. Their request was rejected. On Monday, the court issued its sentence -- the biggest capital punishment verdict in the history of the Egyptian judiciary -- without hearing the defence arguments. The defendants' papers will be transferred for perusal to the office of the grand mufti, the country's official authority for issuing religious edicts, as Egyptian law stipulates that all death sentences be reviewed by the mufti for ratification. The court has set 28 April for the final verdict to be passed, once the grand mufti pronounces his final say. The law allows the verdict to be appealed. According to Haggag El-Hosseiny, Al-Ahram reporter in Minya, families of the defendants broke down when the verdict was issued, but no violence took place. Meanwhile, security forces have intensified in Matay, hometown of the majority of the defendants. Numerous families took their children home from schools after rumours of a potential reaction by Muslim Brotherhood loyalists began to circulate. Lawyer Gamal Eid, director of the Arab Network for Human Rights Information, described the court's verdict to Ahram Online as "a disaster" and "a scandal" for Egypt. "Even if they are tried in absentia, you do not sentence 529 defendants to death in three days," Eid exclaimed, adding that the court proceeding was a scandal in its own right. Nasser Amin, a member of the semi-governmental National Council for Human Rights said on his official Twitter account: "This court ruling will be overturned as soon as the defendants demand a retrial," adding that the verdict was unprecedented. "This verdict is a first in the history of Egypt and will remain in [the nation's record] for good," lawyer Mohamed Zarie, who heads the Arab Penal Reform Organisation rights centre, told Ahram Online. "We need to see if such numbers [of collective capital punishment] are found during the times of Hitler, [Iraq's] Saddam [Hussein] and Joseph Stalin," he added. In a sharply contrasting verdict, a Cairo court last week sentenced a police officer to 10 years in prison with labour in connection with the deaths of 37 Islamists in a crammed police van last year. Three other policemen were given one-year suspended sentences. "Both verdicts are historic," Zarie said. However, founder of the anti-Morsi Rebel campaign Mahmoud Badr dissented with critics of the ruling on his facebook page. "Whoever does not like the verdict needs to stand in front of the mirror and ask themselves: would that be your reaction if the same verdict was issued against Mubarak and 528 of his regime loyalist?" Badr wrote. The exceptionally swift trial and harsh sentences highlight the escalation of a sustained crackdown on Islamists since the military's 3 July, 2013 overthrow of Morsi following mass nationwide protests against his turbulent year in power. On 14 August, Egyptian security forces moved in on two sizeable protest camps by supporters of ousted president Mohamed Morsi in Cairo, leaving hundreds dead and unleashing days of deadly street showdown. Police stations across Egypt came under attack in the aftermath of the dispersal leaving more than two hundred police officers dead, and dozens of churches – mainly in Upper Egypt's Minya, Sohag and Assiut – torched or damaged. At least 1,400 people, mainly Islamists, have been killed in street violence since 3 July, according to rights group Amnesty International, and thousands incarcerated. The deposed leader himself faces a number of trials on a wide array of charges, including inciting the murder of opposition protesters, espionage and a jailbreak during the 2011 uprising. Most of the Brotherhood's senior leaders are behind bars, with a number standing trial on the same charges as Morsi, some of which carry the death penalty. Meanwhile, a rising Islamist insurgency in the border Sinai Peninsula has increasingly targeted police and army, killing tens of policemen and army soldiers. Deadly bombings and shootings have recently also spilled over into mainland cities, including the Nile Delta and the capital Cairo. Officially designated a terrorist organisation by the state, Morsi's Brotherhood – the country's largest and oldest Islamist group – is accused by authorities of links to the militant violence rocking the country. The Brotherhood vehemently denies any such links, Insisting that it is a peaceful group. Ansar Beit Al-Maqdis, an Islamist militant group, has claimed responsibility for several attacks on security forces. In one of the harshest verdicts since the authorities' crackdown on Islamists began last summer, an Egyptian court last week sentenced 17 students to 14 years in jail on charges that include rioting and damaging public property during protests at Cairo's Al-Azhar University in 2013. A similarly unprecedented verdict last November drew widespread fury when 14 Islamist women, including seven minors, were sentenced to 11 years behind bars over similar charges during a pro-Islamist protest. The sentences were later slashed to one-year suspended terms. Egypt is ruled by some narrow minded who think that they are living in in twelefth century ,in Europe of course. NOT in Egypt. To those who don't know. The sentence was handed out because most of the 529 terrorists that some are defending here in the comments, are on the run for their crimes (murder, attempted murder and terrorism) and did not appear in court to defend themselves. The ones who showed up had no real defense as they and their crimes were identified by the 17 eyewitnesses who were let go. With no realistic defense, except their blind faith that they have the freedom to kill whoever they like since they have western support, the judge had no choice but to issue the death sentence. Those who killed innocents and burned worshipping places all over the country must pay the price of their crimes. We will prevail over CHOAS and establish ORDER in my kingdom; Egypt. Those hard-core criminals killed innocent people and spread mayhem all over the country. They deserve "El-Hud". We will defeat evil forces and move from Darkness to enlighten. BH of Kazabeen are the modern version of "Khawarej" and must be exterminated s early Muslims did in the past. Is Egypt realy that kind of barbarian? No more holidays in that country! But what proofs were submitted and shown to us? Compare this case with the case of 2011 victims at Tahrir. In that case, the one who must take the responsibility for that because he was the top of this country - was acquitted. Egypt under this military junta is a disgrace. It looks like Egyptians like to live under the rule of pharaons. There should be zero tolerance for terrorists. I have no sympathy for those killers. Congratulations to the bravery of this Judge. Down with the Brotherhood! Law and order will be maintained. No matter who the hater is. Everyone who supported the brotherhood will be hunted down. There is no mercy for criminals. You think you're bad, trust me you haven't seen bad. You think you can commit evil acts, you will see more evil. Law, order and justice are there for good but must use evil to repel it. Fire fights fire. This is the time of fire. I hope the time of water will be here soon. "Ultranationalist Nazis"? Oh please, do you even know what you're talking about? Quite frankly the Egyptians are getting what they deserve for voting for that Islamist felon. Would this have happened if we had voted for Shafeek? We're going to be stuck in this cycle for years on! We will never understand the true meaning of democracy and free speech. Our regime is still corrupted, we aren't properly functioning. Riots and protests aren't the answer, but I can tell this year's presidential elections aren't going to go well. 529 get executed for supporting a democratically elected president, but not Mubarak. But not Tantawi, but not Sisi, but not the killers of Khaled Said, this regime is a regime of Ultranationalist Nazis willing to kill anyone who oppresses them, don't want any Nazis to say they were terrorists. Tell their family that.